Arius was a protopresbyter of the Church of Alexandria, and in 315, he began to blaspheme against the Son of God saying that He was not the true God, consubstantial with the Father, but rather a work or creation of God and different from the essence and glory of the Father. He also taught that the Son of God had a beginning. These teachings shook the faithful at Alexandria. The Bishop of Alexandria, Alexander, attempted to correct Arius through admonitions, cut him off from communion, and finally deposed him in 321 through a local council. Arius continued with his heretical teachings, creating controversy and division in the churches of other cities, which led to a theological and ecclesiastical crisis throughout the Christian Church. 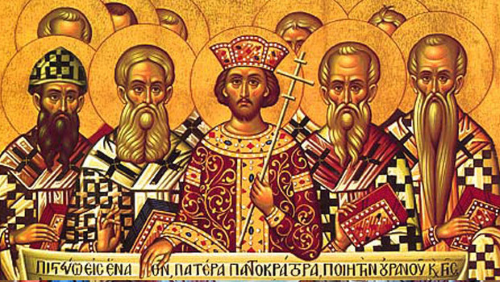 Moved with divine zeal and concern for unity, the Emperor Constantine the Great, equal to the Apostles, summoned the First Ecumenical Council in Nicaea, a city of Bithynia. It was in this place that the bishops of the Church gathered in 325. All of them, with one mouth and one voice, declared that the Son and Word of God is one in essence with the Father, true God of true God. 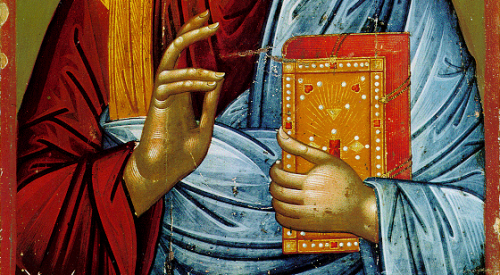 The Fathers composed the holy symbol of Faith, the Nicene Creed. Read more on the Greek Orthodox website. We will be celebrating the Ascension Divine Liturgy that evening. Choir practice will continue Wednesday June 15, 2016 at 6:00pm. We will be celebrating the Ascension Divine Liturgy that evening. Bible Study will also be cancelled on Wednesday June 15, 2016. Fr. Hans will be out of town. 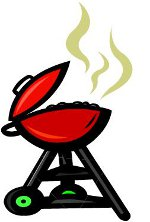 Mark you calendars for June 19 for a Pentecost/Father’s Day Luncheon following Divine Liturgy and the Pentecost Prayers. The luncheon will begin following the Pentecost Kneeling Prayers after Divine Liturgy. The menu includes souvlaki and other items. Please RSVP on the website. Our congratulations to fire-fighter, paramedic, and St. Peter’s member Harry Zafiris for winning the Phoenix award. Harry is a first responder — one person among others who helps people at car accidents, cardiac arrests, and other emergencies called into 911. The Phoenix Award is given to first responders who brought back to life, through their highly trained efforts, patients who were clinically dead, with no heartbeat or breathing. 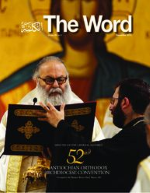 The Word is the official news magazine of the Antiochian Archdiocese. Published monthly (with the exception of July and August) the magazine circulates to the households of all members of the Antiochian Archdiocese and other subscribers including libraries and seminaries. While content is primarily intended to keep readers informed of Orthodox news, it also educates and inspires with articles on faith and practice. Grace operates as well through the unworthy, so that we are sanctified as well though unworthy priests. Struggle to the very end. The whole point of the struggle is not to be delivered from the struggle, as it will go on forever. The reason to struggle is that the more you do, the better chances you have of being successful in your struggle. Most of us live outside our heart, and our mind is in a constant state of confusion. Some good thoughts may surface from time to time, but the majority will be harmful, and this destructive condition will prevail for as long as we continue to ignore our heart…The prayers of a fragmented mind have neither clarity nor depth, but a mind that is reunited with the heart overflows with humble prayer and has such strength that it reaches the ears of the Lord. Thus, my brother, if you love peace of heart, strive to enter it by the door of humility, for no other door but humility leads therein. How should we pray for the sick? Remember them daily. Say their names and ask God to bestow mercy and grace on them. Blessed art Thou, O Lord, the God of our Fathers. For Thou art just in all Thou hast done. In those days, Paul had decided to sail past Ephesus, so that he might not have to spend time in Asia; for he was hastening to be at Jerusalem, if possible, on the day of Pentecost. And from Miletus he sent to Ephesus and called to him the elders of the church. And when they came to him, he said to them: “Take heed to yourselves and to all the flock, in which the Holy Spirit has made you overseers, to care for the church of God which he obtained with the blood of his own Son. I know that after my departure fierce wolves will come in among you, not sparing the flock; and from among your own selves will arise men speaking perverse things, to draw away the disciples after them. Therefore be alert, remembering that for three years I did not cease night or day to admonish everyone with tears. And now I commend you to God and to the word of His grace, which is able to build you up and to give you the inheritance among all those who are sanctified. I coveted no one’s silver or gold or apparel. You yourselves know that these hands ministered to my necessities, and to those who were with me. In all things I have shown you that by so toiling one must help the weak, remembering the words of the Lord Jesus, how He said, ‘It is more blessed to give than to receive.’” And when he had spoken thus, he knelt down and prayed with them all. At that time, Jesus lifted up His eyes to heaven and said, “Father, the hour has come; glorify Thy Son that the Son may glorify Thee, since Thou hast given Him power over all flesh, to give eternal life to all whom Thou hast given Him. And this is eternal life, that they know Thee the only true God, and Jesus Christ Whom Thou hast sent. I glorified Thee on earth, having accomplished the work which Thou gavest Me to do; and now, Father, glorify Thou Me in Thy own presence with the glory which I had with Thee before the world was made. I have manifested Thy Name to the men whom Thou gavest Me out of the world; Thine they were, and Thou gavest them to Me, and they have kept Thy word. Now they know that everything that Thou hast given Me is from Thee; for I have given them the words which Thou gavest Me, and they have received them and know in truth that I came from Thee; and they have believed that Thou didst send Me. I am praying for them; I am not praying for the world but for those whom Thou hast given Me, for they are Thine; all Mine are Thine, and Thine are Mine, and I am glorified in them.